With college rapidly approaching and her decision made to study composing, Garrop, who was living in the Bay Area in California, studied during the remainder of her high school years with H. David Hogan, a local teacher who also was a composer of choral and cinematic music who was especially known for his work in France, where he once studied with the legendary Nadia Boulanger. Garrop, now 47, left California after high school and moved to the Midwest where she studied composition at three powerhouse music schools – earning her bachelor’s at University of Michigan before completing her master’s at the University of Chicago, and then her doctorate at Indiana University. Today, as a full-time independent composer, Garrop is flourishing with numerous commissions along with a Music Alive residency which has paired her with the Champaign-Urbana Symphony Orchestra not too far from her metro Chicago home. One of those commissions is this year’s Utah Arts Festival award for a new chamber orchestra piece, Postcards from Wyoming, which will be premiered by Sinfonia Salt Lake on Saturday, June 24, at 4 p.m. in The City Library auditorium. This is the second world premiere of a Garrop composition since mid-May, when Celestial Canticles was performed by the Boston Choral Ensemble as the winner of its 9th Annual Commission Competition. Garrop’s music is richly imagistic and approachable in the most positive sense, primarily because of her love for literature, poetry and the compelling dynamics of good storytelling that engages the reader. And, in Postcards from Wyoming, that will be premiered in Salt Lake City, she draws upon her experiences from three years ago at the Ucross Foundation Artist Colony that was housed in one of the state’s most sparsely populated areas on a vast cattle ranch. Garrop, who has lived and worked in the metro Chicago area for many years especially during her teaching days at Roosevelt University, was struck by the stark isolation and wildlife presence she observed at the colony in Clearmont, Wyoming. Garrop has stayed periodically at various artist colonies but none were as remote as this experience of having “art in the middle of nowhere,” as she explains. She snapped 400 photos of the natural settings and wildlife she observed and which were rotating as her screensaver on her computer. Garrop had started musical sketches at the Ucross Foundation colony but then because of her university duties and the deadline to complete a large-scale oratorio work, she set aside the music for this work temporarily. When news came of the commission, Garrop decided the time was right to turn the sketches and her memories into a full-scale composition, a musical version of “wish you were here” sentiments visitors might send back to their loved ones. The first of the work’s three movements is High Plains Prairie, and the music suggests there are two different paintings. One is on a stark, minimal white canvas that marks an unrelenting horizon from the vantage of the high elevation meadow landscape. The other is lush, colorful and lively, as one notices close up the dynamic life and sounds in the sagebrush, blooming flowers and plants, insects, creeks and streams. The movement then closes by returning to the simple opening that marks the more austere canvas. In the second movement, Call of the Wild, Garrop recalls the frequency and variety of wildlife that crossed by outside her studio window. There were turkeys, rabbits, snakes, raccoons, mice and other animals but deer were especially abundant in numbers. She didn’t recall seeing any predators, but she says there was plenty of evidence of just how wild the surroundings were. “Hunting season began and then one night while driving to a bonfire, we hit a raccoon and the animal didn’t have a chance,” she says. The music conveys not only the secluded high terrain but also how incredible the wild world can be, including the sights of animal carcasses or the sounds of strong winds or howling coyotes. The final movement, The Solitude of The Stars, reflects upon how an urban dweller is awed at the nightly scene of a sky twinkling with countless stars along with an occasional meteor and a brilliantly illuminated moon. Postcards from Wyoming was completed during a major shift in Garrop’s career life. Last year, after 16 years of teaching and building a composition program for the Chicago College of Performing Arts at Roosevelt University, she decided to become a freelance composer to concentrate on producing new works and becoming an artistic entrepreneur in gaining visibility and performances for her new music. Garrop’s intellectual curiosity especially for outstanding literature and storytelling is nourishing her creative energies on all fronts. For example, the recently completed choral work Celestial Canticles interprets three poetic texts by Yeats, Longfellow and Wordsworth. In a video clip for the ensemble, she explained the inspiration for her work, which harkens to her childhood days when she went to a planetarium show that was accompanied by Pink Floyd music. From Yeats’ Cloths of Heaven, she focused on the imagery of giving riches to the person one loves. In Longfellow’s The Galaxy, she gives the chorus a scherzo that explores the immense breadth of the Milky Way and then in Wordsworth’s The Prelude, she draws from a tiny excerpt (“The universal spectacle throughout was shaped for admiration and delight”), emphasizing the word ‘universal,’ which is sung through a lengthy, deliberate progression of harmonic tonal and textured shifts. Visual storytelling elements from diverse sources have been a prominent driver in Garrop’s music. Her love of mythology inspired a five-movement symphony based on famous women characters including Penelope, Medusa and Pandora. For other commissions, there were tie-ins to the film noir genre and to Alfred Hitchcock that made writing the music easier than if she had not researched or made the relevant connection. And, some commissions have even been more specific, such as Illuminations, a string quartet Garrop wrote for a commission by Nicholas Yasillo in honor of his wife, Susan, who was deeply interested in the illuminated Books of Hours, that were widely used by lay people during the Medieval Ages to guide them during the daily cycle of prayers. For this commission, Garrop drew on several pages from the Book of Hours of Catherine of Cleves. Garrop is following up her Utah Arts Festival commission with many projects that will come to fruition later this year and in 2018, including one with the Kronos String Quartet, in which she sets the text of Studs Terkel, the great Chicago activist and oral historian. Garrop’s first concerto for alto saxophone and wind ensemble will be premiered through a new consortium, coordinated with Brian Doyle at SUNY-Potsdam and 15 universities throughout the country, including her alma mater in Ann Arbor, Michigan. The consortium ensures 15 premiere performances of the concerto through the next several years. Krakatoa, her new concerto for viola, strings and percussion, was funded by the Barlow Endowment and it will be premiered in the U.S. as well as in Indonesia by the Bandung Philharmonic. 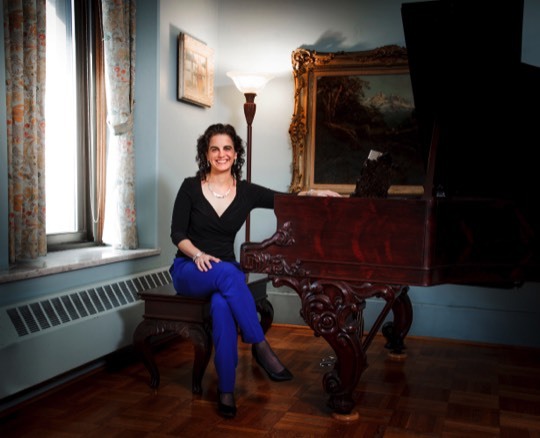 And, in her new residency with the Champaign-Urbana Symphony Orchestra, which is being sponsored by New Music USA and the League of American Orchestras, Garrop will be able to present other works from her extensive catalog. Garrop’s work will be performed in a chamber music concert that includes several other premieres of short works including a solo violin piece by Jared Oaks and No hay camino by Miguel Chuaqui for the Sinfonia Salt Lake Sextet. Chuaqui is a former Utah Arts Festival commission recipient. Other works to be performed in the concert include Ben Wahlund’s The Whimsical Nature of Small Particle Physics for snare drum and electronics and Igor Iacimciuc’s Sonata for Clarinet and Piano.